Several start-up carriers that were given licences have not been able to begin operations, leading to the expiry or revocation of such permissions. This has put a question mark over whether they will eventually be able to take to the skies. 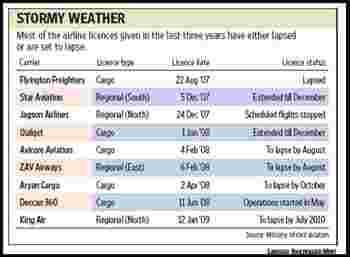 Of the some 10 licences given out by the civil aviation ministry over the past three years to cargo and regional carriers, just three have been able to operate, and that too a limited number of flights, according to the ministry. The failure by the others to even start operations comes at a time of falling air passenger and cargo traffic in the country, seized by an economic slowdown. Analysts estimate national carriers made losses of around $2 billion (around Rs9,500 crore) in the fiscal year gone by. The country’s airlines are largely divided into three categories: national carriers such as National Aviation Co. of India Ltd-run Air India and Kingfisher Airlines Ltd; cargo carriers such as Blue Dart Aviation Ltd; and the likes of Club One Air that are charter aviation operators. In 2007, the ministry of civil aviation, buoyed by air passenger growth rates of 40%, introduced a new category for airlines to increase regional connectivity by offering licences for each of the country’s four different regions. The turbulent times have dragged the airline industry into vortex of problems. But almost two years after the announcement, of the several companies that were granted permissions to set up infrastructure to start regional operations, only MDLR Airlines Pvt. Ltd and Jagson Airlines Ltd—both of which already were running charter operations before the regional airlines policy—have flights in operation. Given the delay, several of the carriers are now seeing their licences being revoked. Aviation rules mandate that if a carrier has not been able to start operations within 18 months of the grant of licence, the permission stands cancelled. Deccan Chronicle Holdings Ltd-promoted Flyington Freighters Pvt. Ltd, which had placed an order for 12 Airbus SAS-made A330-200F long-haul aircraft valued at $175 million each in 2007, was the first one to decide not to go ahead with a launch and has seen its licence lapse at end-February. Now, the airline will need to submit a fresh proposal to seek a scheduled cargo airline licence under the rules. “Within validity period, they can seek an extension citing reasons for the delay," said a senior government official, who didn’t want to be identified. Deepak Parasuraman, managing director, Flyington Freighters, denied that the aircraft orders have been cancelled and said the firm plans to get its licence back. “All our Airbus orders are in place and we will be starting the cargo airline," he said, but did not reveal by when the airline plans to import the aircraft. An Airbus spokesperson in an emailed reply said “there are no changes in (aircraft) delivery slots after first half of 2010". Others, such as Quikjet Cargo Airlines Pvt. Ltd, part-owned by Infrastructure Leasing and Financial Services Ltd, Infrastructure Development Finance Co. Ltd and Tata Capital Ltd, has at least one aircraft grounded for many months now but no operations in place. Instead, the firm has sought an extension of six months until December to avoid the licence being cancelled. Another start-up regional carrier, Star Aviation Pvt. Ltd, which was expected to start operations by now as reported by Mint earlier, too, has sought an extension of its licence until end-December. Jagson Airlines has moved its operations from a scheduled regional airline licence to a non-scheduled airline licence after its regulatory permit was not approved by the Directorate General of Civil Aviation (DGCA). Licences for start-up Avicore Aviation Pvt. Ltd and ZAV Airways Pvt. Ltd are likely to lapse by August, and Aryan Cargo Express Pvt. Ltd by October. “It’s lean season; economy is down, industry is down. In such a case, it is better to wait for positive signs of recovery and then launch," Aryan Cargo’s managing director Mukut Pathak said, but added he is hopeful of launching operations soon. The G.R. Gopinath-owned Deccan Cargo and Express Logistics Pvt. Ltd, which operates under the brand Deccan 360, is the only cargo carrier to have taken to the skies this year despite low cargo traffic both in the domestic and international market. Pathak said he still would wait before launching operations. “We wish him all the best," he said of Gopinath’s launch of the Deccan service in May. “We will learn from his mistakes."